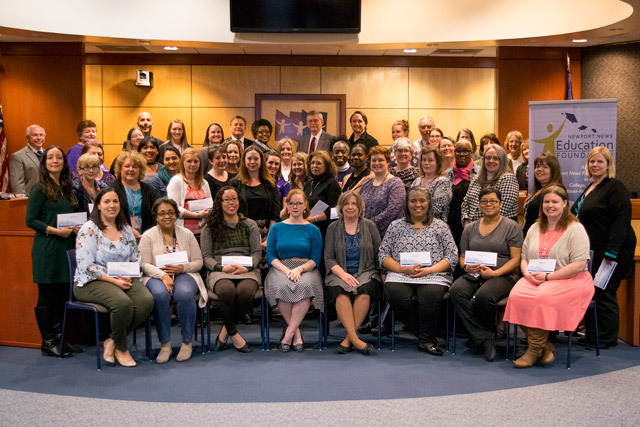 (04/13/2018) -Nearly $13,300 was awarded to 54 NNPS teachers, representing 26 schools and alternative programs, at the 2018 Instructional Innovation Mini Grants Showcase and Awards ceremony on March 26. Over 90 projects designed to enhance student learning were submitted and 51 were selected for funding. The program is sponsored by the Newport News Education Foundation in partnership with the Hampton Roads Chapter of the National Council for Jewish Women and Newport News Public Schools. Over $123,000 in teacher innovation mini grants have been awarded since the program started in 2008. Pamella Bond Gatewood PEEP What can I engineer? Cynthia Watson Marshall Let’s Play a Game! Kristin Hayward Watkins We Love Nursery Rhymes! Karen DiGiorgio B.C. Charles OzoBot a New Way to Learn About Math, Science, History and Literature? Patricia Bell Discovery STEM Academy Learn, Explore, Play! Stephanie Andrus Crittenden Fake News or Real News? That is the question!